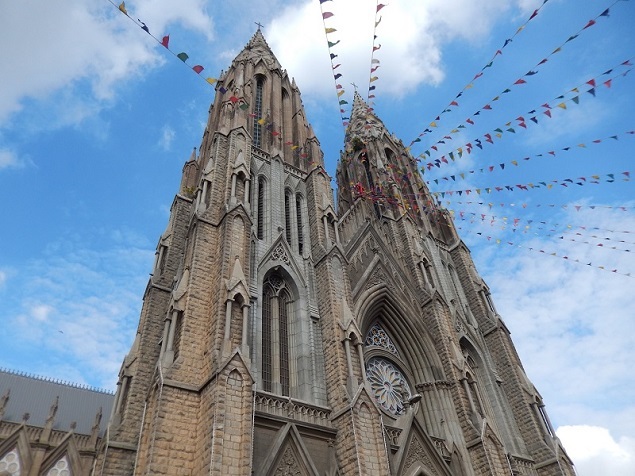 St. Philomena’s Church, Mysore. Photo Credit: Benjamin S. Mack/GALO Magazine. Night falls fast in the jungle. That factoid may seem simplistic enough, but it takes on a whole new meaning when one is actually in the jungle. And that’s exactly where my close friend Kesi — a large man of Tamil descent with short hair but thankfully much longer patience — and I were, bumbling about through the thick bush in the South West Indian state of Karnataka. At least we weren’t alone. Accompanying us on this trek through the wilderness was also Sesank, an almost constantly smiling friend I had first met in Berlin (and who was kindly letting us stay at his house near the city center of Bangalore, officially known as Bengaluru), as well as his zoologist wife and another companion. But it was only five of us against all manner of creatures that lurk in the Indian wilds — including Bengal tigers, leopards, Asian elephants, lesser false vampire bats, several species of highly venomous cobra, and more. We didn’t stand a chance should one of them come out to greet us, not even Sesank’s infectious optimism could change our mindset about that. A tinge of exotic crispness hung in the air causing the nostrils to swell from its aromatic richness. The smell was akin to the plethora of spices used in Indian cooking, but it also contained something else, something more…alive. I wished I’d known what exactly a tiger smelled like. A cacophonously loud roaring of chirping crickets or some other type of insect could be heard. Every now and then, the deafening din was punctuated with the howl or roar of unknown forest-dwelling creatures, which may or may not have been imagining us as their next meal. It was certainly unlike Rudyard Kipling’s famed short-story collection The Jungle Book (or Disney’s 1967 animated film adaptation of it), which mostly depicts the Indian jungle’s various inhabitants as helpful creatures who protect, rather than hurt, humans. Where was Mowgli and his singing pal Baloo the Bear when you needed them most? If we were going to be eaten alive, at least the day had been nothing if not eventful. I’d already been in India for the past 48 hours, but it was the first time I’d awoken with the promise of visiting some of the country’s famed temples. I had not been disappointed. Karnataka boasts over 34,000 temples, ranging in size from small shrines no larger than a coffee shop restroom to gargantuan complexes like Murudeshwar Temple (home to the second-tallest statue of Shiva in the world, standing 123 feet, or about 37 meters, high) that make European churches, such as St. Peter’s Basilica in Vatican City, look miniscule by comparison. It was the sheer exoticness of these temples (Hindu temples are, of course, uncommon in Europe) that so fascinated me in the first place. Our journey had begun before dawn at Sesank and his wife’s home, a spotlessly clean compound with granite floors and a large kitchen chock-full of modern appliances, located along a sleepy street just a few minutes’ drive from Bengaluru’s city center that they also shared with several family members (as many Indians do). The ideal place for a first-timer to their region who wished to experience some of its ancient culture, they said, would be in and around Mysore, a city of nearly one million people about three hours’ drive to the southwest in good traffic conditions. As I’d soon learn, traffic conditions in India can sometimes be less than ideal. With over 135,000 traffic fatalities per year, according to the National Crime Records Bureau (NCRB), more people die on Indian roads annually than in any nation on earth. Spend just 30 seconds on a road, and the reasons for such a high fatality rate seem painfully obvious: drivers often disobey any and all traffic laws, and usually ignore speed limits, blowing past red lights and stop signs (if the road has any) — and if on a motorcycle or scooter, they weave in-between vehicles so closely that cars sometimes have to turn their side-view mirrors inward to allow them to pass. But Indian roads are also often littered with non-vehicular traffic. Pedestrians of all ages and walking speeds seem to have no fear when running across even the busiest of highways (indeed, they seemed even braver than famously fearless New York City jaywalkers), slow-moving rickshaws appear to have no qualms about holding up a line of Fords or Toyotas, and, of course — this being India — it’s not uncommon to see a cow moseying by. Add it all together, and roads are chaos incarnate. Several hours in stop-and-go traffic marked by liberal amounts of lurching back and forth and being squeezed into the back of a vehicle that held five people — when it really was only big enough for four — made me all the more appreciative at each of our stops along the way, as the temples provided not just a chance for cultural introspection, but an opportunity to stretch my legs. The rental car thankfully had air conditioning, but with outside temperatures in the high 80s Fahrenheit (about 30 degrees Celsius) and so many people in a confined space, it could only do so much good. That made our first stop, Masjid-e-Ala (located about 9.3 miles, or 15 kilometers, from Mysore proper), all the nicer. Built in 1784 by the order of then-ruler Tipu Sultan, the mosque featured twin minarets mounted on a tall platform, with walls and ceilings decorated with Persian scriptures in fine calligraphy. It may not be the largest mosque around, but its profusion of white stone and the colony of birds that could be seen flapping about high above near the innumerable pigeonholes pockmarking the minarets stirred the imagination nonetheless, calling to mind the ancient fortresses and palaces often described in fantasy novels like Christopher Paolini’s Eragon or J.R.R. Tolkien’s Lord of the Rings. Of particular interest was a large open well, which had several steps leading down to the square basin; for reasons unknown, the water was green. Our wanderings in the mosque — followed by a stop near the slowly meandering Kaveri (Cauvery) River at the aptly named Colonel Bailey’s Dungeon, where in 1780 a British officer who later became the jail’s namesake was executed by Tipu Sultan’s forces after he was chained to a stone slab on the wall — coupled with the heat had made us quite thirsty. It’s well-known that it’s not advisable to drink untreated water in India, but what’s lesser known is that water is plentiful thanks to a rather unlikely source, at least to Europeans and Americans used to cooler climates: coconuts. The average “young” coconut (young coconuts are green, whereas coconuts commonly sold in North America and Europe are brown due to over-ripeness and have milk inside, not water) has anywhere from 200 to 1,000 ml of water, depending on age and size, and the health benefits of the liquid — known as “coconut water” — have helped make coconuts a go-to choice for anyone who wants to be healthy. Among those benefits: low calories, naturally fat and cholesterol free, more potassium than four bananas, rich in antioxidants, lowers blood sugar, chock-full of electrolytes, and more. It’s precisely for these health benefits that coconuts — and specifically coconut water — have been all the rage in the Western world the past couple of years. Simply purchasing a coconut in India is a unique experience. Usually selling anywhere from 35 to 40 rupees ($0.56 to $0.64; 0.53 to 0.60 euros) whole, vendors will typically slice a coconut open for customers directly on the spot with a machete or other large scythe-like hand tool. While “fancier” sellers may offer a plastic straw to drink out of, it’s recommended to simply take the whole coconut to your lips and guzzle the liquid inside like milk from a cereal bowl, if only for the opportunity to “go native”; after all, one can use straws when they’re back home. I’d never even seen a green coconut with my own eyes prior to my arrival in India (minus trips to Oman, Zimbabwe and Israel, almost all of my travels had been to places known more for snow than tropical weather, such as Russia and Estonia). Putting it to my lips after marveling at the ability of the short, broad-shouldered vendor (who was settled just a few minutes from the mosque) to slice such a thick object apart with a single stroke of his machete, the cool liquid was as refreshing as stepping into a walk-in refrigerator after sitting in a hot sauna. Endeavoring not to spill any of it onto the beard I’d been growing for the past year (a task that, I realized, becomes more difficult the longer one’s facial hair gets), I was surprised it didn’t have the same sugary taste many vitamin-rich drinks have. Better yet, it was 100 percent natural, meaning after I’d finished every last drop and scraped the meaty white flesh using a large splinter from the coconut as a utensil (it was incredible how much the flesh’s taste reminded me of an exceptionally chewy tomato), I could be confident that the leftover shell would decompose and turn into compost, rather than contribute to India’s significant human waste problem. For someone as concerned about the environment and global climate change as me, it was a major relief. ← Send Us Your Questions For The Jar Family!